Second-generation iPad mini mockup by Martin Hajek. Timothy Arcuri of Cowen and Company said in a note to investors that he doesn't expect production of the anticipated second-generation iPad mini to ramp up until early 2014. He believes that supplies ahead of the holiday shopping season may be tight, as Apple could face issues in producing high-resolution Retina displays for its 7.9-inch tablet. As a result, he believes total iPad shipments for the holiday quarter may be around 23 million —a number that would be just slightly higher than the 22.9 million units Apple sold in the same quarter a year ago. Arcuri isn't the only one who expects Apple may face production issues cramming more pixels into the iPad mini's display. Word from Apple's supply chain for months has suggested that there may be yield issues at play in developing a 7.9-inch Retina display en masse. 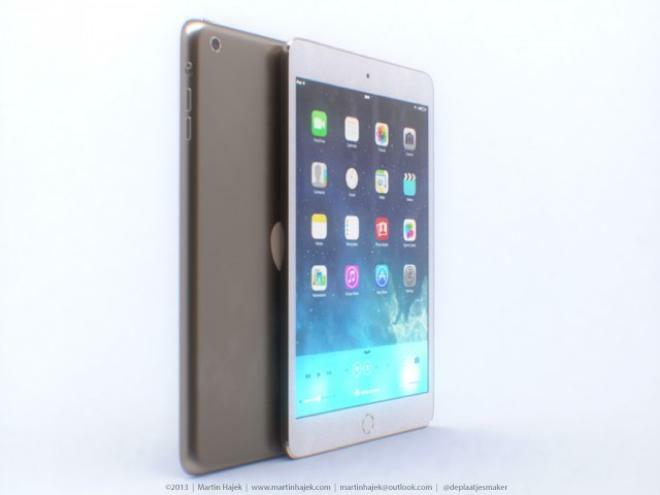 If production of the Retina iPad mini is limited, Arcuri still expects strong demand for the company's anticipated redesign of the fifth-generation iPad. Numerous rumors and leaks have suggested the new full-size iPad will be lighter, thinner, and sport smaller side bezels. Arcuri noted that a complete redesign of the 9.7-inch iPad would be the first such upgrade in years, which could offset cannibalization from the 7.9-inch iPad mini. Both the fifth-gen iPad and second-gen iPad mini are expected to be unveiled by Apple at a media event on Tuesday at 10 a.m. Pacific, 1 p.m. Eastern. The analyst said Monday that he also expects Apple to announce availability for OS X 10.9 Mavericks, the next major upgrade to the Mac operating system, as well as new MacBook Pro models running Intel's latest Haswell processors. Those predictions are largely in line with general expectations heading into the event.